The carriages and services of the Compagnie International des Wagons-Lits are a fascinating subject for study, as witnessed by the large number of books published over the years. However, services and vehicles in Greece have been relatively ignored, with wrong or misleading information having been put out, even within Greece itself from people who should have known better. I have over recent years studied the various sleepers, restaurant cars and baggage vehclies that have been owned by OSE and its predecessor, SEK. I don't claim that the list presented here is complete, there will always be more to learn, but hopefully it may stir up some interest, bring some photos to this forum and enlighten members on a neglected subject. I will also touch upon modelling these coaches in the future. Two preserved vehicles, 3937 & 4001, have been by OSE used for special trains, steam runs, etc. I've travelled in both of these very well kept coaches. Seven Pullman kitchen cars were owned by OSE - bought initially in 1966 by SEK, there were two First Class, ex-Flèche d'Or (4001, 4004) and five Second Class, ex-Étoile du Nord (4102, 4105, 4107, 4108, 4109). These were all built in 1927 in Britain by BRCW at Smethwick, England, for the CIWL trains named above. The main recognition point between the two lots of vehicles is that that 4001/4 have six saloon windows on the kitchen side, whereas 4102/5/7/8/9 have seven since they were originally Second Class vehicles. The opposing bodysides have eight and nine saloon windows, respectively. Most, if not all vehicles have been modified to have the modern UIC pattern corridor connection. The current OSE number check digits listed here are correct; however, they have not always been correctly applied to vehicles in service, for example, there is a photo of 4004 carrying 50 73 88-20 702-2. In addition, 4001 & 4004 are noted to have been painted pale green at some time during their Greek service. All vehicles were converted to standard restaurant cars with revised seating for 35 persons. There is evidence of a previous Greek UIC number sequence, but information is incomplete. Items in RED have been updated/revised. CIWL 4001 – SEK OEφπτ 1001 - OSE 50 73 88-20 701-5 Preserved by OSE, now at Drama railway museum, preserved by ''Ifestos'' club. Very good condition. CIWL 4105 – SEK OEφπτ 1004 - OSE 50 73 88-20 704-9 Destroyed 1972 in the Orfanon collision. CIWL 4107 – SEK OEφπτ 1005 - OSE 50 73 88-20 705-6 Used as night club/restaurant at Rouf yard, Athens. CIWL 4109 – SEK OEφπτ 1007- OSE 50 73 88-20 707-2 Destroyed in collision many years ago near Livadia when turned over and hit bridge abutment. Now dumped at Lachanokipi on Y25 bogies. CIWL 3469 & 51 66 06-41 101-0 - OSE 51 73 06 41 101-1 - 51 73 70-40 297-9 - LX (Metropolitan Carriage & Wagon, Birmingham 1929) Dumped at Nea Magnisia, Thessaloniki. CIWL 3493 & 51 66 06-41 121-8 - OSE 51 73 06 41 121-9 - 51 73 70-40 298-7 - LX (Metropolitan Carriage & Wagon, Birmingham 1929) Present location unknown. CIWL 3604 & 51 66 06-41 015-2 - OSE 51 73 70-40 911-5 - Y (De Dietrich, Lunéville, France 1930) Dumped, Thessaloniki. CIWL 3606 & 51 66 06-41 017-8 - OSE 51 73 70-40 912-3 - Y (De Dietrich, Lunéville, France 1930) Dumped, Thessaloniki. CIWL 3608 & 51 66 06-41 019-4 - OSE 51 73 70-40 913-1 - Y (EIC, Aytré, France 1930) Dumped, Thessaloniki. CIWL 3904 & 51 66 06-41 459-2 - OSE 51 73 71-48 255-8 - YTb (ACM, Nivelles, Belgium 1949) Preserved by local group, Thessaloniki. CIWL 3921 & 51 66 06-41 348-7 - OSE 51 73 71-48 251-7 - YTb (ACM, Nivelles, Belgium 1949) Dumped, Thessaloniki. CIWL 3932 & 51 66 06-41 359-4 - OSE 51 73 71-48 253-3 - Yb (EIC, Aytré, France 1950) Dumped at Athens Rentis. CIWL 3934 & 51 66 06-41 361-0 - OSE 51 73 71-48 252-5 - Yb (EIC, Aytré, France 1950) Dumped, Thessaloniki. CIWL 3937 & 51 66 06-41 364-4 - OSE 51 73 71-48 250-9 - Yb (EIC, Aytré, France 1950) Preserved by OSE. 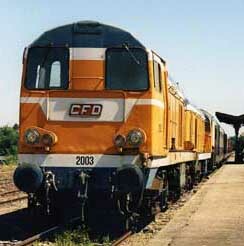 Additionally, there are two ex-CIWL vehicles abandoned in Greece that have never operated in Greek service, having been the property of the French infrastructure contractor Desquenne et Giral who were involved in upgrading the Athens-Thessaloniki main line in the 1980s & 90s, and apparently used them as staff accommodation, along with an old ex-SNCF coach. All three were dumped at Lianokladi in very poor condition when last observed in September 2005. CIWL 2905 Type S1 sleeper (Companie Générale de Construction, Saint-Denis, Paris, 1926. CIWL subsidiary) Noted as having operated in Algeria at some time. CIWL 3341 Restaurant car. (Entreprises Industrielles Charentaises d'Aytré, La Rochelle, France, 1928) This vehicle was one of the famous batch 3341-3360, all of which were sold by CIWL to SNCF in 1962, retaining CIWL insignia & numbering. These ancient wooden bodied CIWL vehicles seem to have a connection with Italy and have been abandoned in Greece, apparently since the late 1960s. Little seems to be known about them. ΣΥφπτ. 19906 - A Type R sleeper, built by Miani Sylvestri S.A. of Milan in 1911 as CIWL 2122 for service in Italy. How it came to be in Greece is not known, but similar vehicles were certainly in use on the Orient Express services in Greece during the 1950s. It is a rare survivor of its type, but is unlikely to be restored. Noted in 2005 dumped at Athens Rentis, currently at Amfiklia. ΣΥ.19905 - This is a restaurant car, formerly CIWL 1394, built in 1923 by the Neu Aubing workshops of the Wagons-Lits company in Munich, Germany. It carries the lettering 'Ferroviaria d'Alta Italia' and 'Vagone Ristorante' on boards above the windows. I know no more about this vehicle. It is in very poor condition, the body is sagging badly and it is probably beyond restoration. Noted in 2005 dumped at Athens Rentis, currently at Amfiklia. Both of the baggage cars listed below were from a batch of eight 1929 rebuilds by CIWL subsidiary Compagnie Générale de Construction, Saint-Denis, Paris, of 1898 CGC-built fourgons 1086(? )-1088 and 1898 Ringhoffer-built fourgons CIWL 1089-1094, all of which had their roof-mounted vigie removed. There is a degree of uncertainty over the original number sequences and the subsequent renumbering. ΣΥ.19908 - In very poor condition. It carries the OSE number 30 73 100 7 118-7. It is possibly ex-CIWL 1301. Last noted dumped at Athens Rentis, probably now at Amfiklia. CIWL 2198 - Another R class sleeper (Companie Générale de Construction, Saint-Denis, Paris, 1911-12. CIWL subsidiary), barely survives at Lachanokipi in the Thessaloniki area - its history is not known. Had been converted to Class R3. Some of these vehicles listed may well have moved on from their last noted locations, or worse, been scrapped by now. The wood bodied vehicles are probably beyond saving, even if anyone wanted to bother, but it was a shame to see them in such a bad state. I will put some photos of these and other coaches up in the coming days, hope you all find this interesting. Last edited by TimCC6558 on Sun Sep 22, 2013 3:26 pm, edited 3 times in total. Great research, well done and many thanks. Could you please give some info on suitable model conversions? thanks Tim! it seems that you have a deep knowledge of the subject. the most comprehensive presentation of these great wagons I have ever seen! One final vehicle I should add is a Type P stainless steel sleeper, number unknown, that was hired by OSE for a brief period in the early-mid 1970s with a view to purchasing further examples in order to rejuvenate their ageing sleeper fleet. Sadly nothing came of this initiative and the vehicle was presumably returned to whence it had come. Photo sourced from the internet, photographer Jörg Dell. CIWL 4004 – SEK OEφπτ 1002 - OSE 50 73 88-20 702-3 ??? Last edited by GAZKGK on Fri Jul 26, 2013 7:24 pm, edited 2 times in total. CIWL 3493 & 51 66 06-41 121-8 - OSE 51 73 06 41 121-9 - 51 73 70-40 298-7 - ??? Brilliant! Many thanks for the photos and information, I will update my records. I too have more photos and some modelling information to post. correction, thanks to Frankie , I have written "with train 603 from Athens", train 603 "Evros" (Ebro) was traveling from Dikea to Athens. Last edited by BarbaPanagos on Wed Oct 02, 2013 5:36 pm, edited 1 time in total.